A table (shown on screen). Columns are mapped to the number row of the keyboard and rows to the leftmost column of keys, and (1) By default the top left cell is selected. (2) The right hand presses the ‘2’ key, selecting the second column (3) The left hand selects the next row (4) The left hand selects the third row. In each case, the position of the cell and its content are read out aloud. Web user interfaces today leverage many common GUI design patterns, including navigation bars and menus (hierarchical structure), tabular content presentation, and scrolling. These visual-spatial cues enhance the interaction experience of sighted users. However, the linear nature of screen translation tools currently available to blind users make it difficult to understand or navigate these structures. We introduce Spatial Region Interaction Techniques (SPRITEs) for nonvisual access: a novel method for navigating two-dimensional structures using the keyboard surface. SPRITEs 1) preserve spatial layout, 2) enable bimanual interaction, and 3) improve the end user experience. We used a series of design probes to explore different methods for keyboard surface interaction. 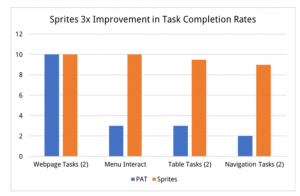 Our evaluation of SPRITEs shows that three times as many participants were able to complete spatial tasks with SPRITEs than with their preferred current technology. A user is searching a table (shown on screen) for the word ‘Jill’. Columns are mapped to the number row of the keyboard and rows to the leftmost column of keys. (1) By default the top left cell is selected. (2) The right hand presses the ‘2’ key, selecting the second column (3) The left hand selects the next row (4) The left hand selects the third row. In each case, the number of occurrences of the search query in the respective column or row are read aloud. When the query is found, the position and content of the cell are read out aloud.